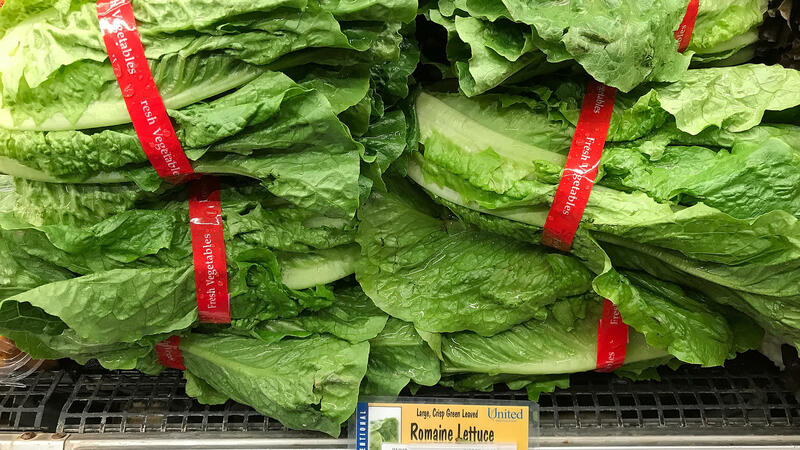 Romaine lettuce is displayed on a shelf at a supermarket in California in April, during an E. coli outbreak traced to contaminated lettuce. The CDC says a new outbreak has made lettuce dangerous to eat, just in time for America's most foodcentric holiday. "It's still early in this investigation and work remains to pinpoint the source of contamination that contributed to this outbreak," Food and Drug Administration Commissioner Scott Gottlieb said in a release. He says there's not enough trace-back information to request a recall from specific romaine suppliers. "The quick and aggressive steps we're taking today are aimed at making sure we get ahead of this emerging outbreak, to reduce risk to consumers, and to help people protect themselves and their families," Gottlieb added. So for now, any and all romaine lettuce should be thrown out, the agency says. That means heads of romaine, hearts of romaine, lettuce mixes and a classic Caesar salad. If you're not sure whether your bagged lettuce includes romaine, chuck it out, the CDC says. And after you do that, be sure to wash and sanitize the crisper drawer or fridge shelf the lettuce touched. 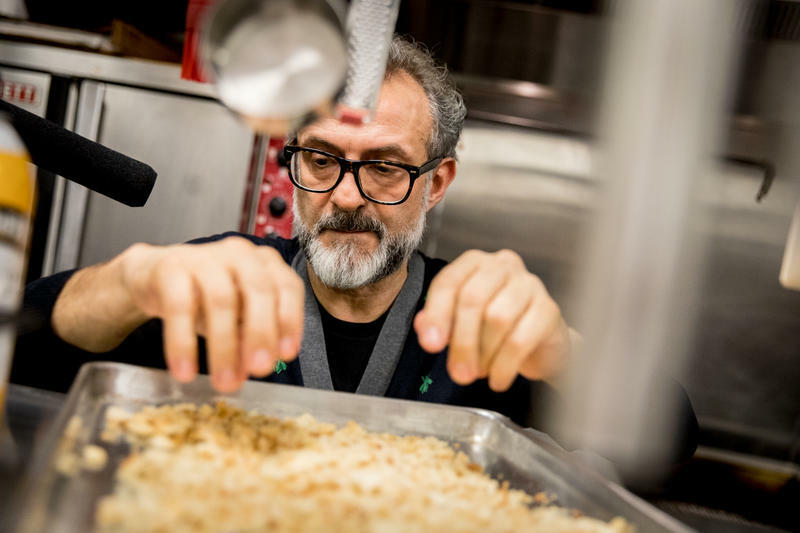 The new outbreak, according to DNA fingerprints, includes the same strain of E. coli as a 2017 leafy green outbreak in the U.S. and romaine lettuce outbreak in Canada. The source of that outbreak was never precisely identified. This is a different strain from the one responsible for another romaine lettuce scare in the U.S. earlier this year, when the vegetable caused E. coli infections in more than 200 people in 30 states, killing five people. In that outbreak, the CDC initially traced the offending greens back to Yuma, Ariz.
A tainted canal was ultimately identified as the culprit. That outbreak, first announced in April, was declared over in June. The leafy greens industry has taken multiple steps over the last 12 years aimed at reducing the risk of contamination. As we've reported, the industry has set up protocols to monitor water quality and adopted standardized buffers to separate lettuce fields from livestock operations. NPR's Allison Aubrey contributed to this report. When Thanksgiving’s profile grew from a harvest festival in New England to a full-fledged national holiday, Texans had a hard time nailing down exactly when to celebrate. Did Texas Host The First Thanksgiving? It's common knowledge that in 1621 the first Thanksgiving was celebrated at Plymouth. But some say the “real” first Thanksgiving took place more than 20 years earlier near present-day El Paso, when at least 400 Spaniards, in an exploration led by Juan de Oñate, feasted with the Mansos tribe. Like any good Thanksgiving discussion, there’s a thread of discord sown through that narrative. While everyone recognizes its importance in the history of North America, some argue that, unlike the feast at Plymouth, it’s not a harvest festival.